The brilliant Mason Williams is the recipient of a plethora of entertainment industry honors, including several Grammy Awards, multiple Emmys and Writers Guild Awards, honorary doctorates, gold records and a gubernatorial appointment as the Musician Laureate of the State of Oregon. Mason was the head writer for the Smothers Brothers Comedy Hour, the New Smothers Brothers Comedy Hour, Saturday Night Live and has written numerous other variety shows and specials. Moreover, his musical compositions have been recorded by hundreds of the world’s greatest performing artists. Furthermore, he’s the author of bestselling books and the creator of many famous art installations that have appeared in museums all over the globe including Bus, an actual-sized photograph of a Greyhound bus in the permanent collections of both the Museum of Modern Art in New York City and the Museum of Contemporary Art in Los Angeles. 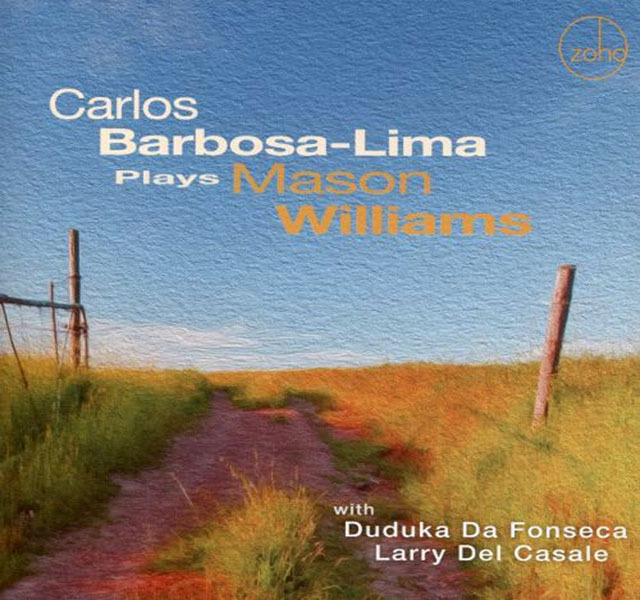 This collection, Carlos Barbosa-Lima Plays Mason Williams, presents one of the world’s most revered musical artists interpreting Mason Williams’ always interesting, entertaining and enlightening compositions. With each tune, Carlos has created a musical portrait. Carlos Barbosa-Lima is today’s foremost exponent of infusing the Latin American perspective into the compositions of Gershwin, Ellington, Cole Porter, Scott Joplin, Dave Brubeck and Lennon and McCartney. Moreover, Antonio Carlos Jobim recognized Barbosa-Lima’s arranging ability and commissioned him to create guitar arrangements of his entire musical oeuvre. Classical Gas This, of course, is Mason Williams’ renowned masterpiece. It topped all three music industry charts: Billboard, Cash Box and Record World in 1968 and garnered Grammys for Best Instrumental Composition, Best Instrumental Performance and Best Instrumental Arrangement. The original recording has been broadcast over six million times. Its television show appearances alone are legion: from The Simpsons to The Sopranos. And “Gas” has been covered on such disparate instruments as ukulele, harp, handbells and bagpipes. Yet, Barbosa-Lima creates the most insightful and unique arrangement ever. Carlos changes the original key from A minor to G minor and reharmonizes it in two parts, the second being played deftly here by guitarist and producer Larry Del Casale. Baroque-a-Nova Mason’s original version was nominated for a Grammy for Best Orchestral Performance in 1968. He said, “It’s a tune created from compositional scraps I had from ‘Classical Gas.’ and a combination of baroque music precision and the upbeat tempo and harmonic structure of Brazilian bossa nova.” Guitarist and producer Larry Del Casale joins Carlos for this synergistic arrangement as they complement Daisy Jopling’s violin lines. Saturday Night at the World Mason says, “This is like a French folk song. The different tempos were an attempt to render two aspects of the way time passes when you’re in love. The adagio waltz indicates how slowly time passes when you’re away from the one you love but the quicker tempo reflects the desire to dance and the dreamy, exhilarating side of romance when you’re with your lover.” Carlos arranged this lovely composition for guitar duet. Sunflower This song manifested into one of Mason’s most famous art installations. He commissioned a skywriter to create petals and a stem around the sun over the desert in Apple Valley, California. The result was a two-mile wide, three-mile high “sunflower” with a life of forty seconds. Mason recalls composing this while exploring a chance compositional concept wherein words were used to create the intervals for melodies. Carlos’ interpretation with guitarist Larry Del Casale, percussionist Duduka Da Fonseca and clarinetist Rick Kriska creates a perfectly languid mood. Fettuccini Western Carlos employing the right-hand Spanish guitar technique rasgueado establishes authority in the opening strains here. But it’s tempered by his seductive musical locution of the atmospheric melody and ultimately revisits the tune’s original perspective at the coda. Mason composed this, in part, while fly fishing. It was originally entitled “Common Ground,” which he recalls referred to the form of the piece being based on a repeating eight-measure harmonic pattern. Katydid’s Ditty Carlos sets the mood using harmonics in the intro and again for the coda. The tune was written for Kate Kahn, a dancer on the Smothers Brothers Comedy Hour whom Mason met in 1968. He affectionately referred to Kate as “Katydid.” Kate later presented Mason with a music box that reproduced the lovely melody. This is a splendid example of Carlos thoughtfully creating an entrancing ambience by interpreting a simple song with imagination and feeling. Riding the Low Moon The song’s title is from a line in Rudyard Kipling’s The Ballad of the East and West. A low moon appears large on the horizon just before dawn, and Mason composed this as “music for a nightly ride” so one can enjoy and experience the sight. Carlos’s virtuosity captures the scene magnificently. Largo-de-Luxe The ensemble, featuring guitarist Larry Del Casale, percussionist Duduka da Fonseca and violinist Daisy Jopling, joins Carlos for this atmospheric tune that Mason composed originally for Jose Feliciano. It exudes a vitality and conveys the South American influences Mason was exploring. His goal was to combine the rhythms of the tango with bossa nova. One couldn’t seriously be interested in the exponents of great classical guitarists & arrangers without encountering the amazing work of Carlos Barbosa-Lima. He is considered the best of the best in both categories. For him to arrange and record a full album of my compositions is beyond my wildest dreams, but it’s a wildest dream come true! The tunes you write are like children you’ve sent out into the world that come back to you. They reflect the myriad experiences they have had but are transformed by them. They are recognizable & yet have become something surprisingly unique on their own. Carlos is considered by those in the know as a genius and an artistic advocate, if you will, of musical compositions and someone who creates magnificent guitar transcriptions and truly vivid arrangements. Moreover, he has bestowed that genius on the artistry of Gershwin, Ellington, Scott Joplin, Dave Brubeck, Lennon & McCartney & others; so for me to be included among those extraordinary composers is an honor I would never have even imagined possible. His brilliance shines a light on my body of work that illuminates so many of my other compositions. Produced by: Larry Del Casale, Kabir Sehgal. All Arrangements by: Carlos Barbosa-Lima. Project Concept by: Carlos Barbosa-Lima, Larry Del Casale, Jim Carlton and Mike Turbeville. Recorded by: Leslie Bloom at Alchemy Post Sound, Peekskill, N.Y, December 12, 13, 2015, February 6, 7, 2016, and by Milan Bertosa at Hawaii Sound Project, Honolulu, HI, January 13,14, 15, 2016. All Tracks Mixed by: Leslie Bloom at Alchemy Post Sound, Peekskill, N.Y. Mastering by: Hector Martignon. Package Design by: Al Gold. Executive Producer: Joachim “Jochen” Becker. Personnel: Carlos Barbosa-Lima, guitar – Larry Del Casale, guitar – Duduka Da Fonseca, Brazilian percussion – Daisy Joplin, violin – Rick Kriska, clarinet.